Two New Intra-Articular Injections for Knee Osteoarthritis | The Medical Letter, Inc.
STANDARD TREATMENT – Non-drug treatments such as exercise, weight loss, and physical therapy can relieve the pain of knee osteoarthritis (OA) in some patients. Oral acetaminophen has generally been the first drug used. It is less effective than full oral doses of nonsteroidal anti-inflammatory drugs (NSAIDs), but it has fewer adverse effects. Topical gel and solution formulations of the NSAID diclofenac (Voltaren Gel, Pennsaid, and others) appear to be modestly effective in reducing pain, with a low risk of systemic adverse effects. For patients who have inadequate responses or contraindications to systemic anti-inflammatory or analgesic drugs, IA corticosteroid and hyaluronic acid injections have been used as alternatives. ADVERSE EFFECTS — Common adverse effects reported with use of Durolane in clinical trials were arthralgia and injection-site pain. PREGNANCY AND LACTATION — Durolane has not been studied in pregnant or lactating women. IA administration of hyaluronic acid has not been associated with fetal toxicity in animal studies. DOSAGE AND ADMINISTRATION — Durolane gel is supplied in 3-mL single-use glass syringes containing 60 mg of hyaluronic acid. An 18- to 22-gauge needle should be used to inject the contents of one vial into each affected knee. Administration of a second dose 26 weeks after the first appears to be safe. Disinfectants containing ammonium salts should not be used during administration of Durolane because they can cause precipitation of sodium hyaluronate. Any strenuous activities or prolonged weight-bearing activities should be avoided for 48 hours after injection. PHARMACOLOGY — Zilretta is an ER formulation consisting of microspheres of poly(lactic-co-glycolic acid) (PLGA) containing triamcinolone acetonide. It is not interchangeable with other formulations of injectable triamcinolone acetonide. There are no head-to-head trials comparing IA triamcinolone ER with other long-acting corticosteroids, such as methylprednisolone acetate (Depo-Medrol, and generics). ADVERSE EFFECTS — In clinical trials, the incidence and severity of adverse reactions were generally similar with triamcinolone acetonide ER and placebo. In one randomized, double-blind trial, however, in 140 patients with knee OA, administration of a standard formulation of IA triamcinolone acetonide 40 mg every 3 months for 2 years was associated with significantly greater cartilage volume loss than administration of IA saline placebo.12 Local post-injection inflammatory reactions have occurred in some patients treated with an IA corticosteroid. Septic arthritis is rare. Other uncommon local adverse effects include bleeding, tendinopathy, tendon rupture, lipoatrophy, skin atrophy, and avascular necrosis. Systemic adverse effects are also rare. Flushing can occur several hours after injection. Adverse effects commonly associated with systemic steroid use such as osteoporosis and gastric ulcers have not been reported with IA injection of corticosteroids. PREGNANCY AND LACTATION — Zilretta has not been studied in pregnant or lactating women. In animal studies, IM or SC injection of triamcinolone acetonide during organogenesis caused developmental abnormalities in the fetus and fetal mortality. Corticosteroids have been detected in human breast milk and may suppress milk production; it is not known whether use of Zilretta could result in detectable quantities of triamcinolone acetonide in human breast milk. DOSAGE AND ADMINISTRATION — Zilretta is supplied as a single-dose kit containing a vial of triamcinolone acetonide ER microsphere powder, a vial of sterile diluent, and a sterile vial adapter. After reconstitution, Zilretta delivers 32 mg of triamcinolone in 5 mL of diluent. The drug should be stored in a refrigerator before use; the reconstituted suspension can be stored in the vial for up to 4 hours at ambient conditions. CONCLUSION — Like other intra-articular hyaluronic acid products, single-injection Durolane gel appears to be safe for use in patients with mild to moderate osteoarthritic knee pain, but data supporting its efficacy are unconvincing. The efficacy of hyaluronic acid products in general continues to be controversial, and they are expensive. A single intra-articular injection of extended-release triamcinolone acetonide (Zilretta) can relieve moderate to severe osteoarthritic knee pain and appears to be well tolerated, but one clinical trial found that the new extended-release formulation was not significantly more effective in reducing pain after 12 weeks than a standard triamcinolone acetonide injectable suspension, which costs much less. Until more data become available, there is no good reason to use Zilretta. D Jevsevar et al. Viscosupplementation for osteoarthritis of the knee: a systematic review of the evidence. J Bone Joint Surg Am 2015; 97:2047. H Zhang et al. Comparison of two hyaluronic acid formulations for safety and efficacy (CHASE) study in knee osteoarthritis: a multicenter, randomized, double-blind, 26-week non-inferiority trial comparing Durolane to Artz. Arthritis Res Ther 2015; 17:51. RD Altman et al. Efficacy and safety of a single intra-articular injection of non-animal stabilized hyaluronic acid (NASHA) in patients with osteoarthritis of the knee. Osteoarthritis Cartilage 2004; 12:642. NK Arden et al. A randomized saline-controlled trial of NASHA hyaluronic acid for knee osteoarthritis. Curr Med Res Opin 2014; 30:279. R Leighton et al. NASHA hyaluronic acid vs. methylprednisolone for knee osteoarthritis: a prospective, multi-centre, randomized, non-inferiority trial. Osteoarthritis Cartilage 2014; 22:17. AF McGrath et al. A comparison of intra-articular hyaluronic acid competitors in the treatment of mild to moderate knee osteoarthritis. J Arthritis 2013; 2:108. RR Bannuru et al. Comparative effectiveness of pharmacologic interventions for knee osteoarthritis: a systematic review and network meta-analysis. Ann Intern Med 2015; 162:46. P Jüni et al. 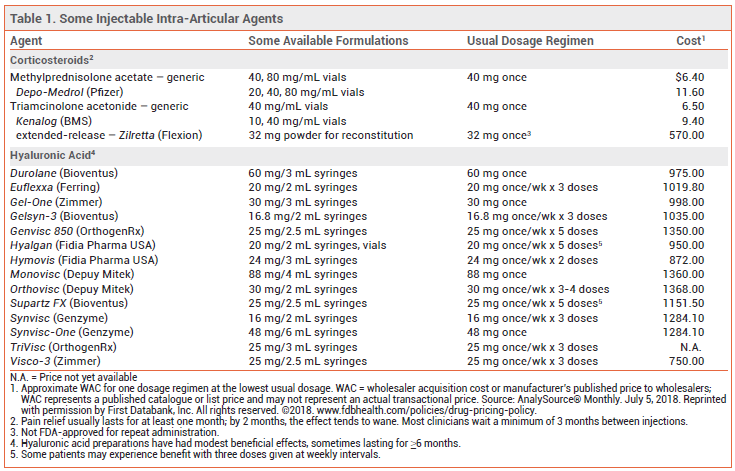 Intra-articular corticosteroid for knee osteoarthritis. Cochrane Database Syst Rev 2015; 10:CD005328. VB Kraus et al. Synovial and systemic pharmacokinetics (PK) of triamcinolone acetonide (TA) following intra-articular (IA) injection of an extended-release microsphere-based formulation (FX006) or standard crystalline suspension in patients with knee osteoarthritis (OA). Osteoarthritis Cartilage 2018; 26:34. PG Conaghan et al. Effects of a single intra-articular injection of a microsphere formulation of triamcinolone acetonide on knee osteoarthritis pain: a double-blinded, randomized, placebo-controlled, multinational study. J Bone Joint Surg Am 2018; 100:666. SJ Russell et al. Triamcinolone acetonide extended-release in patients with osteoarthritis and type 2 diabetes: a randomized, phase 2 study. Rheumatology 2018, in press. TE McAlindon et al. Effect of intra-articular triamcinolone vs saline on knee cartilage volume and pain in patients with knee osteoarthritis: a randomized clinical trial. JAMA 2017; 317:1967.